The TRX single arm row is a beginner level bodyweight exercise that targets the upper back, shoulder and biceps. 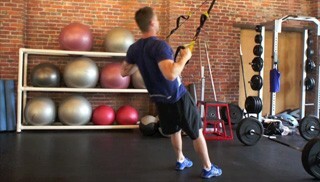 The TRX seated pull-up is a challenging upper body exercise that targets the back, legs and arms. The TRX body weight row is a beginner upper body exercise. This is an excellent exercise that targets the back and arms and is suitable for any fitness level. The TRX squat row is a full body compound exercise that targets the legs, back and arms.